Balmed is a professional therapeutic tub based on the newest technologies used for balneological brine-, peat- and carbonic acid baths. 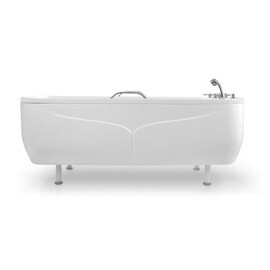 The tub’s basin is ergonomic and made of high-quality acrylic which is chemical-proof and thermally resistant. There are two colours of the basin available: white (standard) or Calypso green. The outer side of the tub consists of durable acrylic reinforced with polyester laminate. Apart from water connection, the Balmed tub’s water system is made of plastic. In order to keep the patient feeling comfortable, the tub has a headrest. ** The outflow min DN 100 min with a throughput of 3.5 L / s over the entire length of sewage installations.